The challenges for industry engagement and corporate relations professionals just keep getting tougher, more complex, and more critical to their universities. The competition for corporate partnerships has grown substantially, and so has the need for an integrated approach that provides potential industry partners with all options available for engagement. Universities that are making corporate engagement a priority – and taking a holistic approach to enhancing industry relations – are finding great success and bringing in new dollars, new resources, and new, more strategic partnerships. At the same time, however, many institutions are still facing the challenge of limited resources coupled with a confusing array of decentralized access points for industry: Research Office, TTO, Foundation, Corporate Relations, and others. This siloed approach makes it difficult to fully leverage corporate relationships. That’s why we’ve launched a unique, how-to publication that helps universities embrace the increasingly nuanced and holistic approach to industry engagement — and prepares their campuses, staff, faculty, policies, and planning mechanisms for a new level of integrated and strategic corporate collaboration. After two-years of publishing Industry-Sponsored Research Management, we are relaunching as University-Industry Engagement Advisor to better reflect the many aspects of holistic corporate partnership development. We will continue to cover key issues and success strategies for forming and managing research collaborations. We will also focus on all the critical challenges and opportunities that fall within the holistic approach to industry engagement. This wider focus will address the many aspects of holistic corporate partnership development and management that are crucial responsibilities of corporate relations and industry engagement professionals. YOU PAY ONLY $297 FOR AN ENTIRE YEAR! BONUS 1: Subscribe to University-Industry Engagement Advisor today at the $100-off rate and you’ll also get the FREE distance learning program Metrics and Benchmarking for University Corporate Engagement: Breaking down silos to gauge performance. This session will provide a roadmap to for bringing your corporate engagement efforts into a more cohesive, holistic strategy while gathering, organizing, and reporting the data you need to gauge the effectiveness of those efforts, report on your progress to stakeholders, and point you to areas needing improvement. This information-packed session regular sells for $197, but it’s yours free with your subscription to University-Industry Engagement Advisor. BONUS 2: Subscribers gain immediate access to our entire two-year archive of Industry-Sponsored Research Management articles. That’s over 100 case studies and expert tactics for building collaborative, supportive and profitable relationships with industry – all at your fingertips on day one when you begin your subscription. 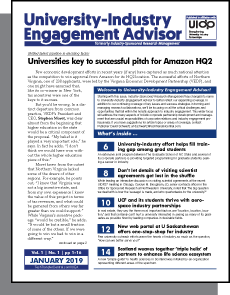 University-Industry Engagement Advisor is brought to you by the same team behind Technology Transfer Tactics, the leading independent publication for TTOs. For more than 11 years, we’ve been providing the world’s best practical guidance on bringing more university technologies to the marketplace, and you can count on the same devotion to excellence and practical value. We believe in the quality of our products, and offer a 100% no-risk guarantee: If you ever become dissatisfied – for any reason – simple notify us for a complete refund, no questions asked. Our coverage will informed by our continuing partnership between publisher 2Market Information and UIDP, the leading national membership group devoted to helping universities and corporations strengthen their partnerships. The group is comprised of both leading research universities and industry members. Given the millions of dollars at stake in your industry engagement efforts – you simply can’t afford to be without this practical, how-to publication. And with the $100 discount, the free archives and the free distance learning program, we’ve made your decision even easier.